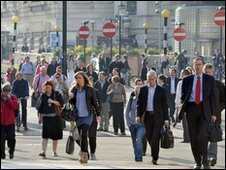 BBC News - How productive is your first day back at work? How productive is your first day back at work? "Surely the answer to that is totally unproductive?" one office worker, who prefers to remain anonymous, replied when I put the subject of this piece to her. Will you be catching up with colleagues via email? "The amount of people staring into space today is amusing." So if you feel like it's taking you a little while to get back into "work-mode" after the Christmas break, the chances are you're not alone. "It's probably likely to be the same as when people have had any kind of break," says Rebecca Clake, resourcing adviser at the Chartered Institute of Personnel and Development (CIPD). "People are going to be spending some time catching up with their colleagues today." But before you start feeling guilty for spending time chatting, there may be some longer term benefits to your post-Christmas catch ups. "On the one hand you might see that as being unproductive," says Ms Clake, "but that's probably really important when it comes to building good working relationships for the new year." Something that is likely to take up a fair amount of people's time today is sorting through their emails. If your workplace was closed over Christmas, then you're unlikely to have many internal emails to deal with. However, if while you were enjoying the delights of festive TV or hitting the post-Christmas sales, or even lucky enough to get away for a winter break, you had colleagues back in the office early, then you may find you come back to an overflowing inbox. "Many people tend to turn off their blackberries over Christmas - that leads to a whole back-up of general information," says Philip Wicks, consultant at IT services group Morse. "Emails can pile up really quickly. The amount of time you spend trawling through them could be a couple of hours or it could be four or five hours." The number of "social" emails you send may also increase. If you want to catch up with a colleague on the other side of the office but don't want to be seen by your boss standing and chatting for ages, what better way to do it than while sat at your desk, while looking like you're working away feverishly? "Normally after a weekend, you have a quick catch up for two minutes. After Christmas, that can take an hour. Similarly, over email that can extend to a great deal of time too," says Mr Wicks. However, while some people may be taking their time to get back into the swing of things, there may be others out there putting you to shame. "It might be if you were feeling stressed out pre-Christmas you might come back ready to tackle your to-do list and sort your priorities out in the new year," says the CIPD's Rebecca Clake. "It might be that some people are starting to think about 'new year, new job'. More companies will probably be advertising jobs in the new year." Cath Roan, managing director of Careershifters.org, a website that provides advice on changing career, certainly agrees with this. "We always see a massive surge in traffic to our website in the new year and our workshops are always busiest at this time of year," she says. Grace Owen, career coach and author of The Career Itch, believes people fall into three broad categories on the first day back after Christmas. Some people will come back feeling refreshed - more focused and more ambitious. She herself probably falls into that category. "I'm feeling really productive. I went for a run this morning," she says. Others will feel like it's time for a change, and consider trying something completely different. Though she concedes that there will always be those who don't really relish returning to work and feel like they're just getting back on the treadmill. But she adds: "With the economic situation as it is, people want to do what they can to survive." And, as Philip Wicks from Morse says, the day's sluggishness won't last for long. "The first day is a peak [of low productiveness]. After that, people tend to knuckle down."